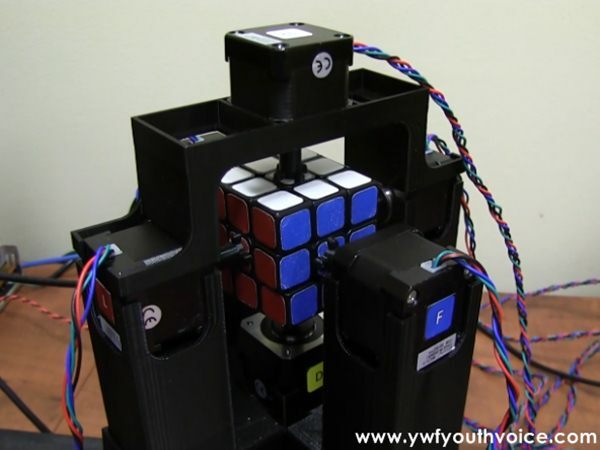 This robot can solve the Rubik's Cube even before you can say 'Rubik's Cube'. Watch the video of this cool robot that is gonna break all records. In the time it takes you to say the word 'Rubik's Cube' the homemade computer built by two software engineers from Kansas, US, has already solved the iconic puzzle, clocking in a time of just 1.047 seconds to get the job done. The creators, Jay Flatland and Paul Rose, uploaded a video to YouTube of their robot getting 'hands-on' with the Rubik's Cube. The robot in question relies on information from USB web cameras that “see” the cube in real time. It’s coupled to a computer application running on a Linux operating system to determine the moves required to solve the Rubik’s puzzle. There are six stepper motors controlled by an Arduino chip that manage the acceleration and deceleration of the robot's movements. Each of the motors has 3D-printed feet that slide into delicate holes drilled into the sides of the Rubik’s Cube. The current Guinness world record for a robot is a relatively sluggish 2.3 seconds, with the humans lagging behind with 4.9 seconds, which was set by 14-year-old Lucas Etter in November 2015. The two men are currently in the process of applying for the world record title.